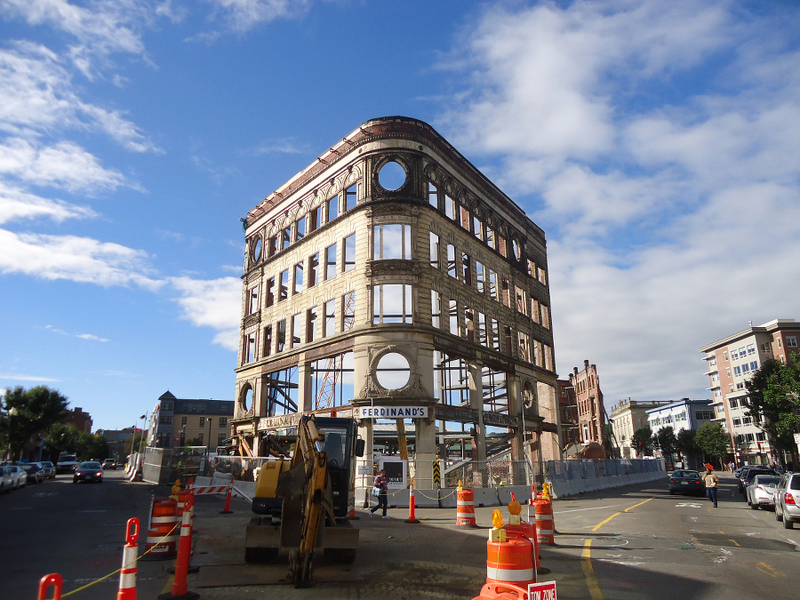 Curving brick and glass facade heralds Roxbury’s resurgence. 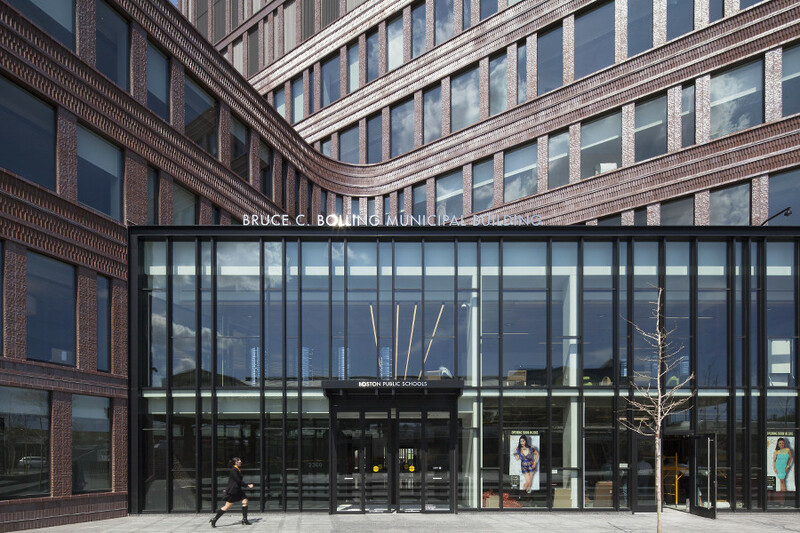 By locating their new administrative building in beleaguered Roxbury, Boston Public Schools [BPS] made a powerful statement of faith in the area’s resurgence.“Bringing the BPS right into the heart of Roxbury anchors the redevelopment of the neighborhood,” explained Friso van der Steen, manager of international projects at Mecanoo. 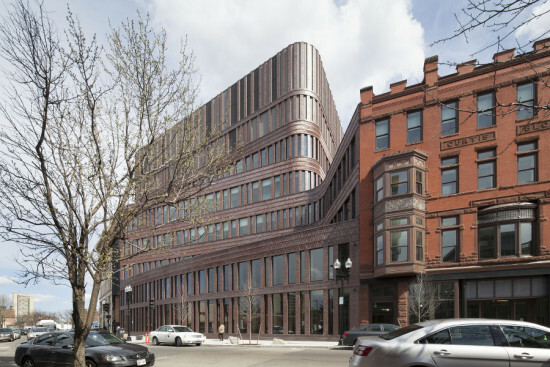 The Dutch architects collaborated with local firm Sasaki Associates on the project—their first built in the United States—which involved renovating the facades of three historic buildings and weaving them into a coherent whole with a new volume. 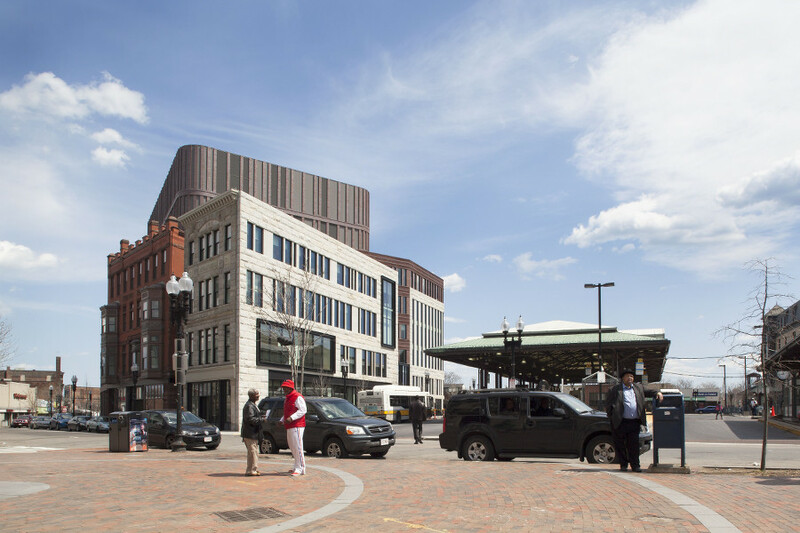 Described by Mecanoo as “a Bostonian building with a Dutch touch,” the structure’s curving brick and glass envelope projects a hopeful future for Dudley Square. 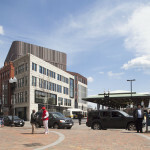 When Mecanoo and Sasaki won the competition to design the Bruce C. Bolling Municipal Building in 2009, the largely vacant site in Dudley Square, Roxbury’s commercial and transportation hub, “contained a number of derelict buildings,” recalled van der Steen. 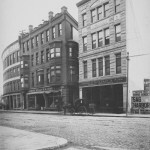 These included the 1895 Ferdinand building, which was to be integrated into the project. 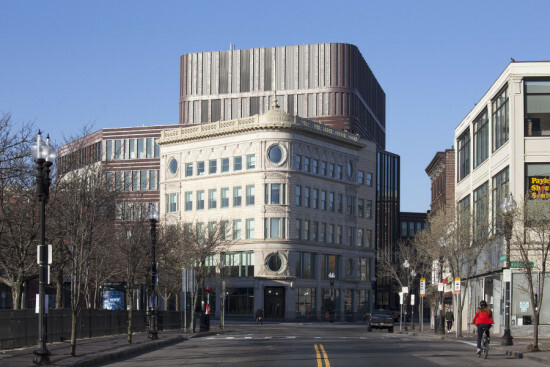 The architects convinced Mayor Thomas Menino to add two other historic structures to their portfolio: the 1888 Curtis building, and the 1890 Waterman building. 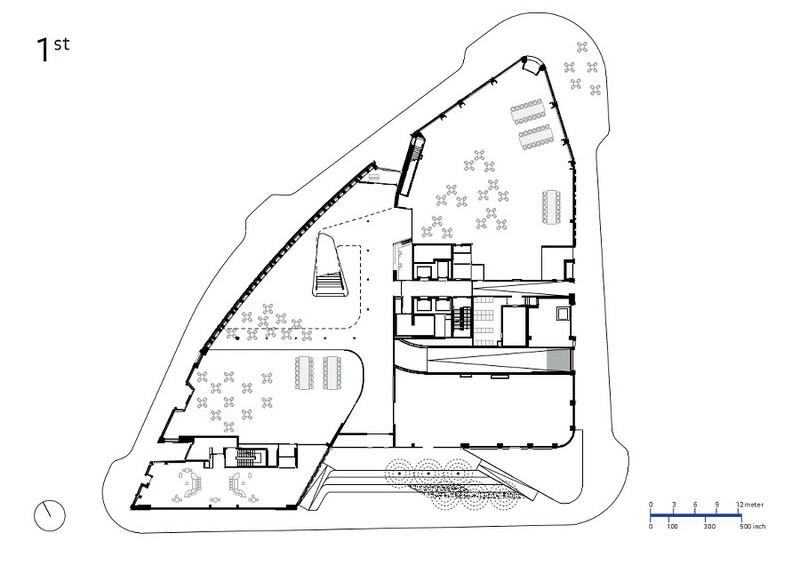 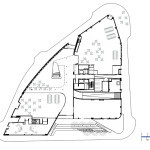 “This allowed a design inclusive of the three corners of the triangular plot,” said van der Steen. In cooperation with preservation consultants Building Conservation Associates, Mecanoo and Sasaki completely restored the facades of the three existing buildings, each of which was built in a different style. 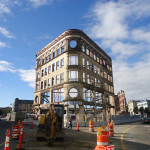 The five-story Ferdinand was constructed of limestone, terra cotta, brick, and granite, and is characterized by large oval windows at the corners and ends of the building, plus a large copper ornamental cornice adorned with cast lions’ heads. 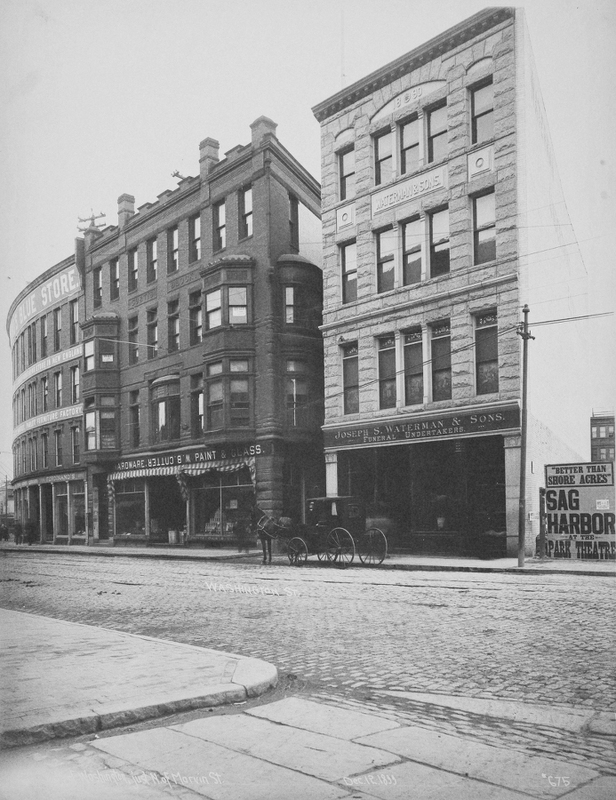 The red brick Curtis was built in the Queen Anne style, while the Boston Granite Waterman features copper bay windows brought up to snuff by the renovation team. 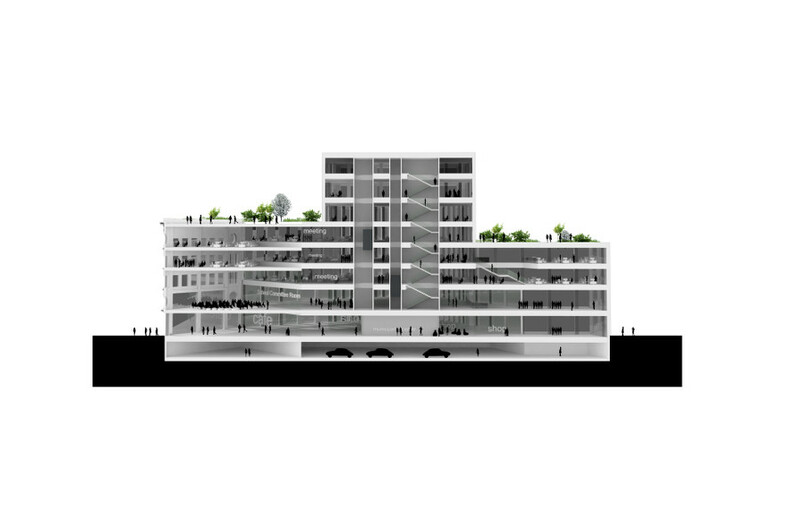 For the new volume, the architects looked both to the surrounding urban fabric and to their own strengths. 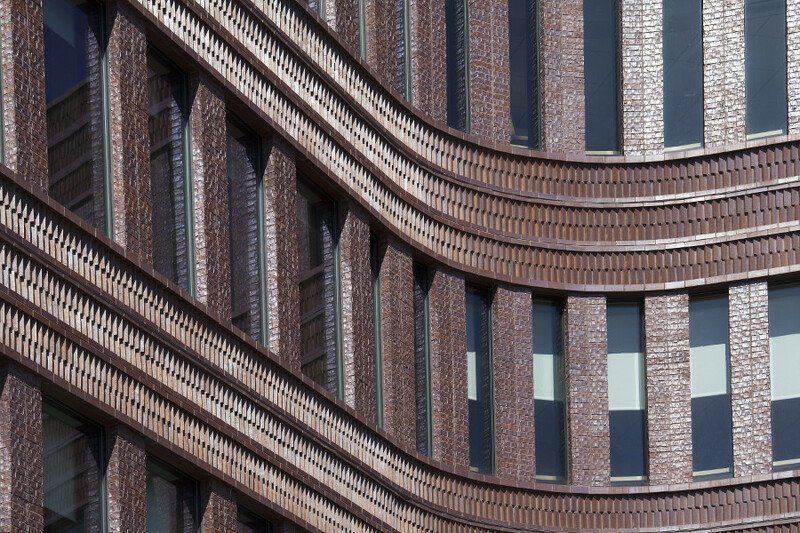 “Boston has a very rich tradition of using brick,” said van der Steen. 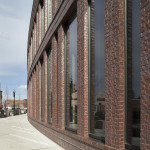 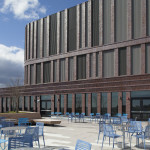 “Coming from ‘the clay country,’ The Netherlands, we have used brick in many projects, and we really wanted to use it here to show off the craftsmanship that goes into bricklaying.” Working with Iron Spot brick in three different finishes—smooth, velour, and artisan—the design team deployed a variety of bonds—running, stack, and soldier—to create delicate reliefs and shadow effects. 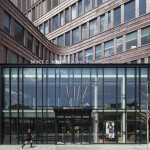 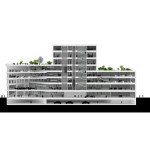 “Mecanoo and Sasaki spent a lot of time and effort to design an inviting, permeable public space,” said van der Steen. 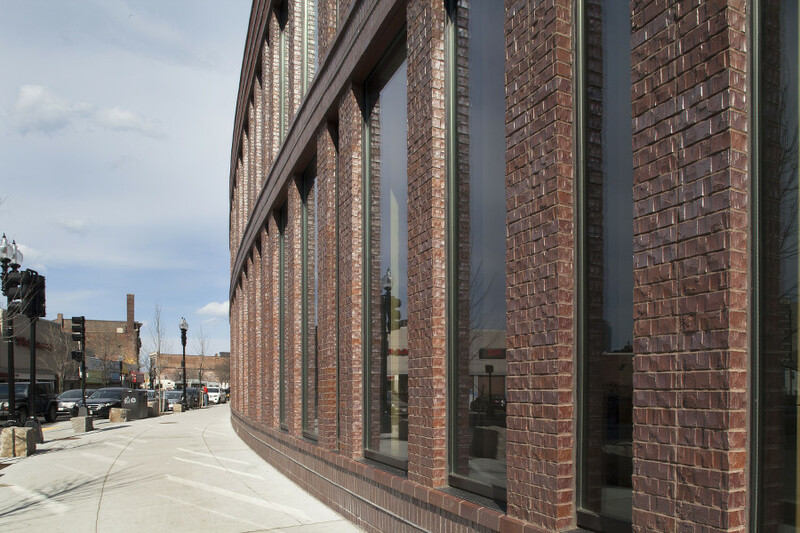 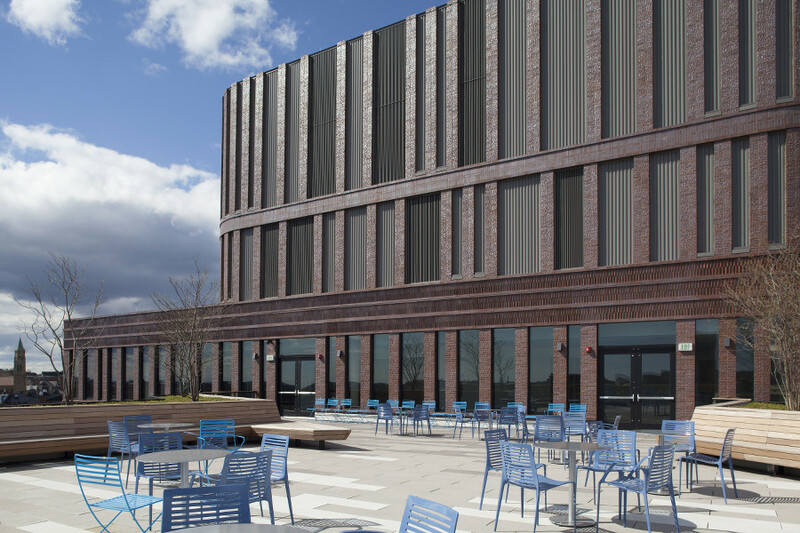 Vertical punch windows render the curving brick facades of the new volume permeable, while the transparent entry invites residents to take advantage of the community resources (including a neighborhood gathering space and facilities for obtaining informal business guidance). 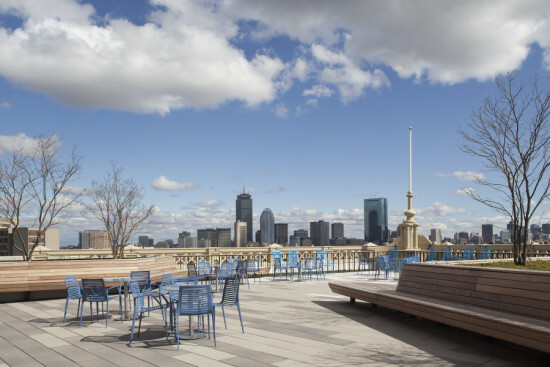 A sixth-floor roof deck overlooking downtown Boston makes a visual connection to the city center, and the illuminated mechanical penthouse serves as an orientation point after dark.